Lunar Lanterns have been installed around Circular Quay to celebrate the Sydney Lunar Festival. In the Chinese zodiac, every year is symbolised by an animal and this year is the Year of the Pig. 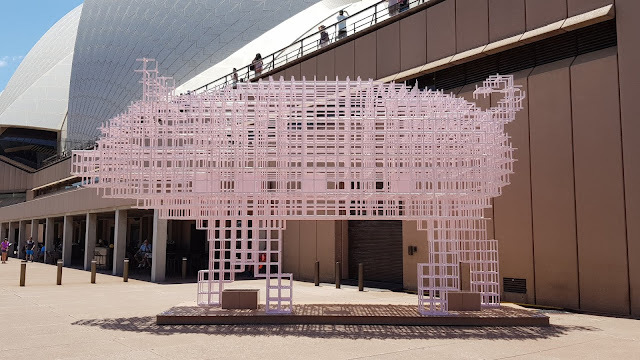 The forecourt of the Sydney Opera House features this giant lantern of a pig. Created by Qian Jian Hua, it is a deconstructed three-dimensional grid which has been carved out to form an abstract silhouette of a pig. The zodiac symbol of the Pig can be characterised as honourable, philanthropic and optimistic. They can be incredibly focused and achieve great things. Linked to: Our World Tuesday, Tuesday Treasures, Pictorial Tuesday, Travel Tuesday, Pink Saturday. That's a pig! Great photo!